Woodstock Soapstone Co. Blog: Ouch! It was an "ouch" moment for us, but it has been turned into an "ahh" moment for you. We had an unfortunate morning last Friday, when our website went down. We apologize for this mishap, and hope you did not encounter the same frustration we experienced. This issue has been addressed and resolved, so should not happen again. We have extended our "Plain and Simple Sale" for one week as our way of apologizing for any inconvenience you may have had while trying to access our website. what you and your home will need this winter. 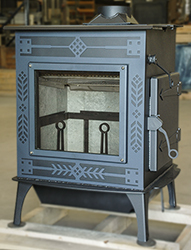 We are also offering discounts on our other hybrid wood stoves, the Progress and the Ideal Steel, along with savings on our three older models, the Fireview, Keystone, and Palladian.